The longer I get into this trip, the more that time seems to fade away. It’s hard to comprehend that I left Australia nine months ago. I feel like I’ve been travelling forever, and I feel like I only left yesterday. If I know one thing for sure, I still haven’t hit my travel wall. I’ve run into so many people on the road who are a couple of months in and more than ready to head home. For me, travelling is just as exciting as when I first started and I’m no where near ready to stop. The longer I travel, the more plans I make for future travels. It’s a bit of a vicious cycle, this travelling business. But this month, I did suffer from a huge case of writers block. I was just starting to catch up on my posts, when I gave my whole head start away by only posting four times this month. Solo travelling is great for blog writing- I spend lots of nights or mornings in with just my laptop for company. But being on tours for most of August where spare time was minimal meant that I didn’t get a lot of time to write. And when I did find myself with time, I found myself with a lack of inspiration. I’m hoping I’ve snapped out of it with my recent post on Hvar and I’ll try to get as many posts out as possible in September. Ireland– I did a Paddwagon tour through Ireland and it was incredible. We got to see so much of the country and everything was spectacular. Even their crappy weather couldn’t prevent this country from becoming one of my new favourites. I’d have to say it’s trailing only behind Portugal when it comes to my favourites in Europe. Specific highlights from Ireland would have to be the Giant’s Causeway and learning more about the troubles in Northern Ireland. Celebrating my birthday in Scotland– This year was the first time I celebrated my birthday away from my friends and family. Luckily I had a whole group of new friends from my Haggis Adventures Scotland tour that helped me celebrate my birthday in the sleepy town of Stornoway on the Isle of Lewis. It was a great night and I didn’t miss home nearly as much as I thought I would. Thanks so much for all the birthday wishes! Riding the Jacobite Steam Train (aka THE HOGWARTS EXPRESS) in Scotland- There is a strong chance that if I do anything Harry Potter related its going to make it on to my favourites list. Riding the Jacobite Steam Train and crossing the viaduct from the films was no exception. My Haggis Adventures Tour– less specifically, my whole time in Scotland was incredible. 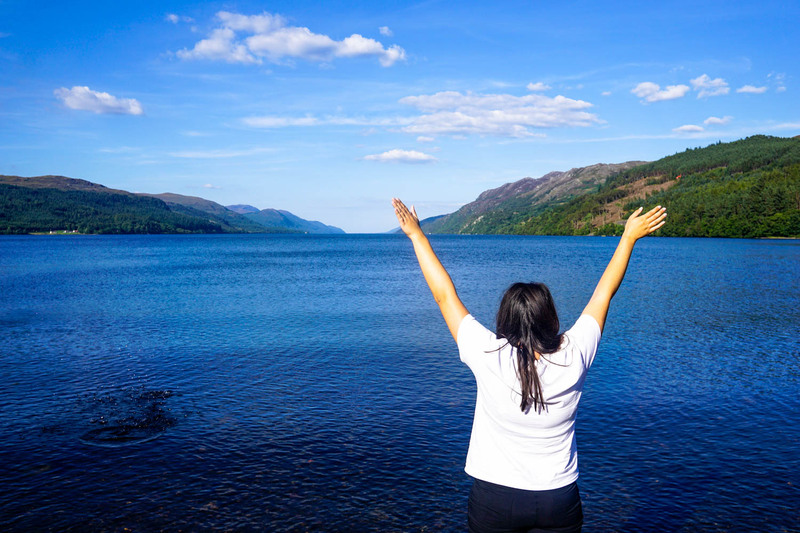 I got to gaze at beautiful lakes, mountains and pools on the magical isle of Skye, wonder at Neolithic settlements on Orkney, try Haggis, dress in tartan and dance on tables, go canoeing on Loch Ness and learn how to do Scottish traditional dancing at a Ceilidh in Oban. The Edinburgh Fringe Festival– I’m so glad that I changed my plans so that I was visiting Scotland during the fringe festival. For the five whole days I found myself in Edinburgh during the festival, I absolutely binged out on incredible comedy, theatre, slam poetry, a capella and circus performances. Highlights would have to be a one-woman theatre rendition of Jane Eyre, an adaption of A Little Princess, the hilarious David O’Doherty and the incredible Driftwood acrobatic/circus performance. I’m already trying to work out how I can go back in the future. My time at the fringe was made even better when my Grandpa (who I hadn’t seen in 9 months) and my auntie arrived. Both sides of my family together in Chester– My cousins that live in the North of the UK came from my dad’s side of the family, and I’ve cherished all the times I’ve been able to visit during this trip. But this time I got a special visit from my cousin on my mum’s side of the family, Elle, who came up to Chester from her new home of London for a visit. It was a great couple of days! Thai Food at Ting Thai Caravan in Edinburgh– Thai is some of my favourite cuisine and it had been so long since I had good thai food. Luckily, I managed to grab a seat at Ting Thai Caravan in Edinburgh and have some delicious meals between shows. Their tom yam was incredible, as well as their pad thai. Although I’m afraid its made my thai cravings worse, not better. Pierogis in Poland– The Asian versions of dumplings are one of my favourite foods, but until I arrived in Krakow, I had never tried the Polish version. This famous and popular polish dish is dumplings filled with anything from the typical fillings of meat, cabbage and mushrooms, or cheese and potatoes, to even sweet versions filled with strawberries, fruits or nutella. They are so delicious. I can’t wait to return to Poland next month to eat some more of them! Saying goodbye to Chester for the final time– My Aunt, Uncle and cousins in the Northern England have been the safety blanket I needed for the first few months of my trip. They made sure I didn’t spend Christmas alone, they were a safe base to return to when I needed a break, and most importantly they were the lifeline I could call if something went wrong. Everytime I’ve left Chester this trip, I’ve taken comfort in the fact that I’d be back. But this month was the last time I’d be in England and it was harder than I thought to leave knowing that I most likely wouldn’t be back. I absolutely knew this was going to be one of my most expensive months. Tours are always more expensive than independent travel and I took two this month. Luckily, both of the tours were paid in full before I arrived so only about half of the amount of this money actually came out of my bank account. As always you can see all of my individual expenses in this spreadsheet. Only four I know! Promises to try harder next month! I’m not surprised at all that all but one of my most popular photos from this month came from Scotland, with three from the Isle of Skye. It really is a magical place. And for the first time in a while, the most liked photo was also my favourite of the month! That feeling when the sun rays start to peak through the clouds after three days of rain ? The island of Skye couldn’t be more magical! I’ve been in Scotland for a whole day but because I spent that whole day bingeing on comedy at the Edinburgh fringe festival, I don’t have any pretty pictures yet. So here is one from one of my favourite places in the world! Even my killer hangover and only two hours of sleep couldn’t dampen the causeway coast! Scottish cliff sides never get old! So happy to have had the opportunity to get to the Orkney islands.
? Sing me a song of a lass this is gone. Say, could that lass be I? Merry of souls she sailed on a dais, over the sea to… Skye ? – Exploring Skye yesterday was the best day of the trip so far. Finally being able to see the fairy pools and all of their magic was just incredible. I’m not sure this part of the world could get anymore beautiful! I know where I’ll be until about the middle of this month. I’m heading to Prague and Berlin with my Pa who will fly out on the 7th. I won’t be boarding my booked flight to Turkey because I unfortunately cancelled those plans over safety concerns. Instead I’m staying on in Berlin until the 11th when I’ll fly to Latvia. I’m trying to turn over a new leaf this month and embrace spontaneous travel. I need to be back in Berlin on the 16th of October for my flight to New York but up until then I’m free to fly wherever the wind takes me. It’s an exciting feeling! Oh and I promise more posts next month!